Did you celebrate Pi Day on March 14th? I celebrated by starting a pi shawl. Several years ago I got the urge to knit a beaded pi shawl. I even bought the yarn and beads for it. Bright, pumpkin orange yarn. Actually, it's Malabrigo lace weight in Glazed Carrot, not pumpkin. And then I thought about the reality of a bright pumpkin/Glazed Carrot, beaded pi shawl.... and I set the yarn up on a shelf. Sometime last year, still thinking about a pi shawl, I took the yarn down off the shelf and balled one skein. 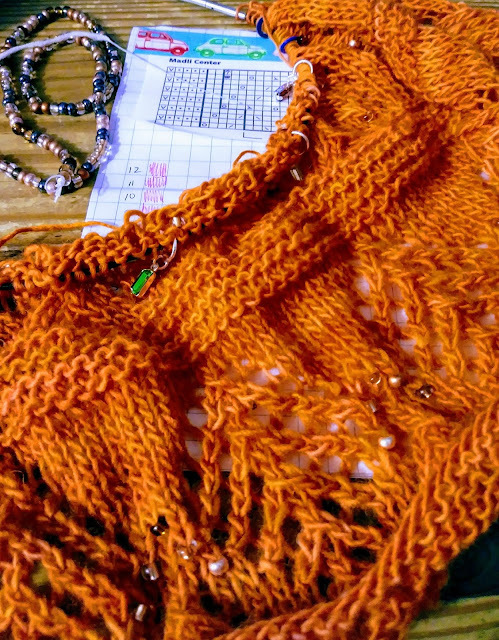 And then I thought about the reality of a bright pumpkin/Glazed Carrot, beaded pi shawl and put the yarn back up on the shelf. Then Pi Day rolled around this year and I'd finished the beaded cowl late the night before... and I couldn't stand it anymore. I cast on for a bright pumpkin/Glazed Carrot, beaded pi shawl. And I screwed up the cast on and ripped it. And cast on again, and screwed it up and ripped it. Again and again I cast on and ripped. It took me six tries to get the knitting going properly on the dpns. Six tries! It was an omen and I should have known. I knit around and around, following some lacy pi shawl pattern I'd found on Ravelry. I knit and knit some more and finally it was time to switch to circular needles. And then all Hell broke loose. I have no idea how it happened or what I did but... It looked like somehow, in the process of knitting off the dpns and onto circular needles, I yarn overed 50 - 60 times, very, very tightly. 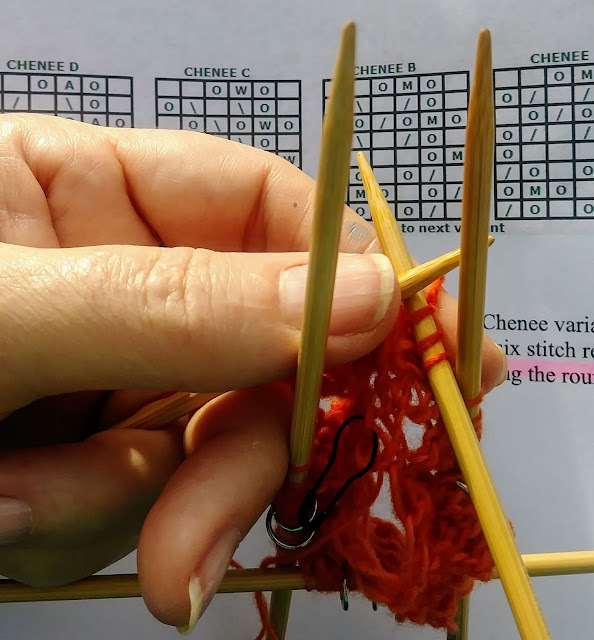 The weird yarn overs were so tight they would barely move along the needle's cord and there was no way they'd slide up onto the actual needle. I pulled and tugged and thought I was going to break the needle but those weird yarn overs wouldn't budge. I ended up having to cut the knitting off the needle. I still don't even know how or what I did to mess it up so badly. And in my frustration, I ditched the pi shawl idea and started knitting a lacy stole type shawl that will be worn as a scarf, not a shawl. The pattern is Madli's Shawl published in Knitted Lace of Estonia. And I love it! I'm a little further along on the knitting than what's shown in this photo and I'm so happy I gave up the pi shawl idea. While beads and bright pumpkin/Glazed Carrot yarn may not make for traditional Estonian knitting, I'm loving the result. And yes, I'm beading instead of knitting knups. Y'all know how I feel about knups. Thankfully there are only two out of each twelve rows that are beaded. It's not as time consuming as it sounds. Now, let's see how I feel about this shawl design after I've knit thirty one, twelve-row pattern repeats. Been there done that with the pi shawl cast on. It's a bear. I really like the new pattern. In fact, it looked so familiar I had to go to my project page on Rav to see if I'd made one. I have that book. I didn't but I did make one similar for the DIL for her wedding. You had me going there a minute. I thought I was terrible forgetful for not remembering Madli as a Pi shawl. LOL! I had that on my list for eons, but never got around to it. I will watch for your finish!!! I LOVE orange!!! I am sticking to simple because all that lace makes my eyes cross. Good luck with your project.